There are hydrangeas and there are hydrangeas! Compromise, compromise. Can’t make up it’s mind if wants to be pink or blue. Wouldn’t have done very well in the blue hydrangea class in the flower show, now would it! By the way, we had no tomatoes to enter, and the garden fuchsias got beaten up by the wind the day before the show so they were ruled out. As were my munched up capsicums. However, Mrs. EX34mush did rather well with her flower arranging, and my Chairman’s Choice fuchsia won me a pleasing Portmerrion vase to make up for the other problems. I have to confess, I like them all. I am liking more and more of them, slowly they are getting under my skin! I would say “thank you” but I have no part in the loveliness of this plant, I did deadhead it but that is about it. All its own work! I must take some cuttings, it has beautiful dark foliage and those bi-coloured flowers are just wonderful. Sorry, it is an “unknown” if anyone has any idea I would be glad to know. 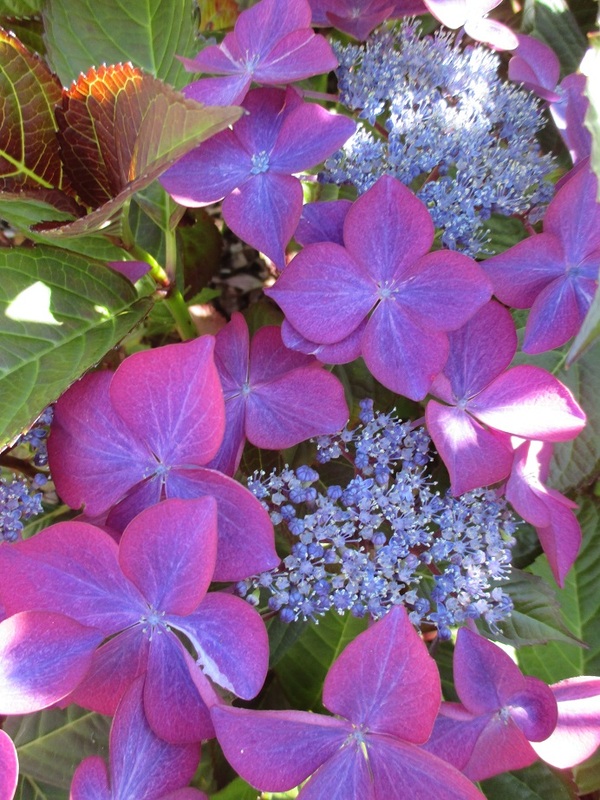 Cracking good photo Gill…..lovely hydrangea too! Thanks David, will be taking some cuttings!